The Ford C-Max has been in production since 2003. 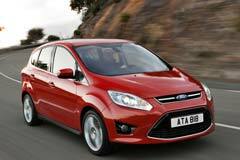 The Ford C-Max Hybrid Hatchback was launched in October, 2012, and is available in two trim levels: SEL and SE. The SE comes standard with full power accessories, 17-inch alloy rims, integrated blind spot mirrors, automatic climate control, cruise control, a driver seat that is height-adjustable, sync voice-activated interface with Bluetooth phone connectivity, leather-wrapped tilt and telescoping steering wheel and a 6 speaker sound system that has a USB/iPod audio interface, auxiliary audio jack, and a CD player. The used Ford C-max hybrid uses a 2.0L 4-cylinder engine that produces 141 hp and 121 lb-ft torque which is paired to an electronic motor that is fed by a lithium ion battery pack. The combination produces 188 horsepower. In addition, the power is transmitted to the front wheels through a continuously variable automatic transmission. The 2012 Ford C-Max comes with front side air bags, anti-lock disc brakes, stability and traction control, side-curtain airbags, a driver knee airbag, rear view camera, and parking sensors.